So. The Riddler. 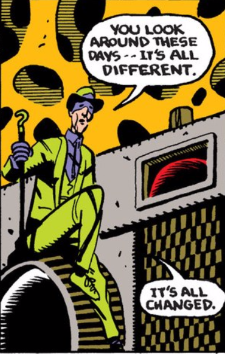 As far as Gotham villains go, his parents were typically not Parent of the Year material - the most "popular" origin for him these days is that his dad beat him when he was little for getting good grades, because Mr. Nygma couldn't stand the idea that his son was smarter than he was, and forced li'l Eddie to "admit" to cheating. The adult Riddler's obsession with twisting the truth via riddles is supposed to be an extension of that... or something. But as I have no desire to discuss such ugly things today, let's look at the times when Mr. Nygma was (implied to be) a semi-decent father. One page from 1989's Secret Origins special.